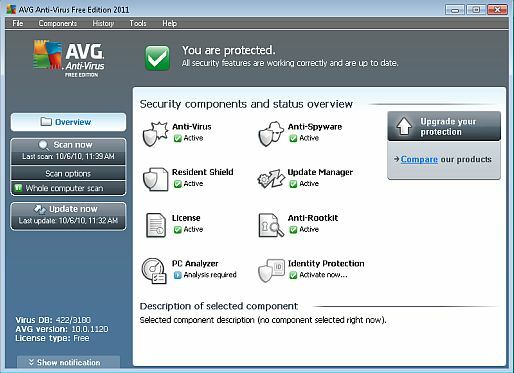 Free AVG 2011 antivirus has been completely revamped over the previous versions. User’s can expect a whole new interface, engine, and even new logo (I think it looks worse than before). Some of the new stand out features are social network protection, faster scanning with a smart scanning engine, and faster updates through collective intelligence and cloud antivirus scanning. The installation of Free AVG 2011 has significantly improved. The installer is only 4 megabytes in size and downloads quickly. Once the software is ready to install, the user is given the option to install the full internet security version or the free version. Of course, I opted to install the free version. I then chose the custom installation. Apparently there is a new Windows 7/Vista widget that shows the status like Norton 2011 does. In the custom installation, there are a lot of customizable settings. One can opt in or out of the installation any component including the link scanner, email scanner, and identity protection etc. This is a great feature because most free antivirus just automatically install, what I perceive to be junk tool bars. Unfortunately, after I customized the installation the Free AVG 2011, the installation crashed, and I had to restart it. I could not get Free AVG 2011 to install on my main review computer with Windows 7 64 bit home premium. I could not find a work around. Therefore, installed it on an alternative notebook which has a Windows 7 32 bit Home Premium. I recommend using the offline installer. I have included it above. The first noticeable change of Free AVG 2011 is that the whole interface has been slightly upgraded. The colors have changed but the original layout of the components has remained the same. The biggest change is the addition of Anti-Spyware (has over 170000 definitions now) and Anti-Rootkit modules. Previously, Free AVG did not have anti-rootkit protection. Next, the update Manager has been upgraded but still has a very serious limitation. This is that Free AVG 2011 doesn’t provide automatic pulse updates like PC Tools 2011 and Comodo Antivirus 2011. In fact, Free AVG will only look for only once every day! In order to unlock updates within the frequency of every hour, one has to update AVG to the full version. I just want to emphasis how serious of a disadvantage this is. In comparison, Norton looks for updates every 15 minutes and frequently installs them during each download. This means that Free AVG could Potentially be 24 hours behind in virus signatures and in a world where new viruses are released every minute leave ones system unsecure. I am also confused how AVG 2011 can protect against zero day threats if it only updates once daily. Free AVG 2011 now has excellent resource usage. During Idle operation, Free AVG 2011 uses about 8 megabytes of RAM across 5 different processes. This is definitely some of the best resource usage I have seen by a free antivirus. During a full system scan, the scanner avgchsvx.exe only uses 1.5 megabytes of RAM but about 25 percent CPU power. Even on a netbook, the performance impact is little to none. However, the scanning time isn’t exactly something to brag about. Just the first time optimization scan took at least a half an hour before actually scanning even started. After that scanning seemed to be about the same as previous versions and completed in about 2 hours. 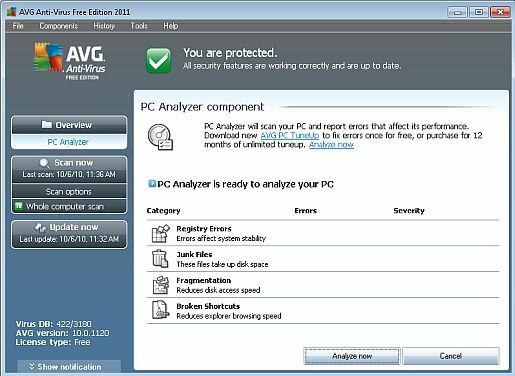 Free AVG 2011 didn’t detect any viruses on the test machine or any false positives. One complaint, is that there still isn't a scanning status bar. A few additional features of interest are that AVG now offers Game Mode. Free AVG 2011 will now detect when an application is in full screen and put the antivirus into suspend mode. I couldn’t find anything specific to how zero day or cloud based scanning is utilized in the settings. There now is a new full featured PC Analyzer which scans for registry errors, junk files, fragmentation, and broken shortcuts. The social protection is integrated into the AVG link scanner toolbar and essentially only scans links against a database of known phishing sites, something that firefox, ie, and a slew of competitors already do. I think Free AVG 2011 is a subpar antivirus. It can scan and detect viruses all of which it does very well. However, AVG needs to offer more premium features like pulse updating and better cloud based scanning. One should also consider Microsoft Security Essentials, PC tools antivirus 2011, or Comodo for a little better free antivirus protection.